5.5.18 Continuing in the series, "Creation in the book of Isaiah" God's Word and the water cycle is compared in Isa 55:8-11. 4.28.18 The Creator's ways compared to Man's. God claims to be the One who creates and thus controls the destroyer (the blacksmith), and though we may not understand--He knows what He's doing. 4.21.18 The wisdom of God vs. the wisdom of Man. A look at what Scripture says about God's and Man's wisdom; passages include 1st Cor 1:18ff, Proverbs 8, and Job. 4.14.18 A creationist at a secular college. How should a creationist respond to the teaching of evolution in their science classes? Dr. Scripture gives some advice, and things to beware of. 4.7.18 Must the 6 days of Genesis 1 begin at verse 1? Perhaps each of the 6 days of creation are demarcated by the expression "God said . . .", thus allowing time between Gen 1:1-2 and Gen 1:3 where the first "And God said. . ." occurs. Dr. Scripture discusses this idea. These two creatures possess strong evidences for design not random mutation resulting in complex structure/function. Several times the prophet Isaiah refers to the Creator "stretching the heavens." Does that phrase refer to space, i.e. an expanding universe, or could it refer simply to the sky--earth's atmosphere? In Isaiah 51, the "Maker" speaks to Israel as would a Father to a child; in chapter 54 He refers to Israel as an abandoned wife, and Himself as her Husband. He promises to "take her back," and cites His promise to Noah and the earth as a guarantee of fulfillment. 3.3.18 Interview with Dr. Ben Scripture on "PeeDeeLive!" 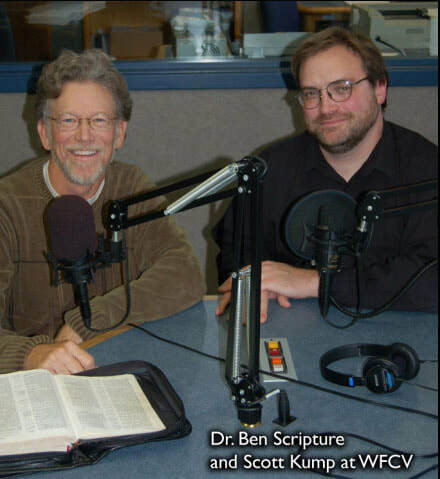 This live interview of Dr. Scripture took place 3 years ago, it was on a popular secular radio station in Florence, SC. In the interview he was able to share his testimony and the gospel, and it's an encouragement to all believers to be ready to be a witness whenever the opportunity comes. 2.24.18 Will Creation Last Forever or Not? A question from a listener prompts a study of passages that speak of the heavens and earth being established "forever," (Psalm 148:6), and yet the Bible speaks of a second heaven and earth, and the present heavens and earth being destroyed. How can these passages align with one another? Prophecies in Isaiah chapters 49 and 50 speak of the creation of a body for the coming Servant. The meaning of the Hebrew idiom "opened My ear" is discussed. The prophecies of Isaiah chapters 44 and 45 are witnessed by Jeremiah who describes them in Jeremiah 4:19-27. He lives through the destruction of Jerusalem. The Creator then explains He will save His people for His own sake. SCRIPTURE ON CREATION is recorded in Fort Wayne, IN. The 15 minute program airs weekly on the Good News Network (Southeastern US), and the Harbour Light network in the Windward Isles of the Caribbean. Scott Kump and Dr. Scripture have been teaming up to produce the question and answer formatted program for over 16 years. TO LISTEN NOW: Click the audio file from the program list below. A brief description of each is there. TO LISTEN LATER: SOC is available for free download as well as a podcast. To download the latest episodes, or to find out how to subscribe to the podcast, please visit our podcast page. Creation Matters report on soft tissues found in the "Messel Pit" fossil site. In this program we discuss the discovery of preening oil still preserved in the unfossilized oil gland of a bird--oil that is just like the oil found in birds today. Creation Matters reports on soft tissues found in Sea Turtle and bird fossils. Amazing fossils found in Germany's "Messel Pit" site said to be 48 million yrs old by evolutionists add more reason to question evolutionary dating of these artifacts. Part 1. Chapter 45 has much to say about the Creator. The Lord identifies Himself to Cyrus (long before he's even born) as the Creator and the One who raised him up to conquer the world. Isa 45:18 (a "Gap Theory" proof text) is also discussed. In chap 44 the One who claims to be "The Lord, King of Israel, Redeemer, Lord of Hosts, first and last" (v 6) challenges anyone to do what He has done. 1.6.18 - Creation in Isaiah Part 16. The Creator makes a gracious promise to His people. 12.30.17 - Brand new research on aging confirms the Word of God . . . again! Dr. Scripture spoke to the youth of the Augusta regional homeschool association, and responded to their questions. "How do we know some dinosaurs were on the ark?" and "What do you think God did when He cursed the ground? "; were a couple of them. The theme of the Creator helping those who trust in Him continues into Isaiah 41, however, the object of God's attention shifts from the individual to the nations. This section also begins the revelation of some fantastic prophecies. Scott interviews Eric Hovind, one of the producers of the limited release movie, "Genesis: Paradise Lost." The movie is going to be shown in theaters on Nov 13 only (some theaters may also show it on 11/16). Eric shares a lot about the movie and his organization, Creation Today in the interview. creatures' features strongly argue for design and against random chance to explain their orgins.